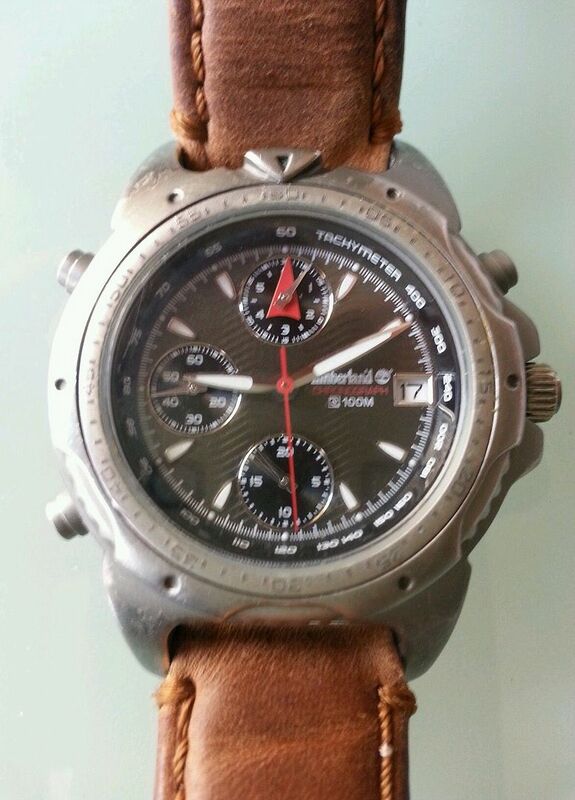 Forum Home > 7Txx General Discussion Area > Spotted an unusual Non-Seiko 7Txx - anybody identify the calibre ? When I'm searching on eBay for Orient J39's and Puma Y19's (their versions of 7A38), I often come across what are obviously 7T32's. Indeed eBay Italy is abundantly awash with NOS Orient 7T32's (or whatever the re-branded Orient Jxxxx calibre designation is). But it's not a 7T32, because it's missing a crown (and the alarm function) - plus according to the dial script, it's a 1/20s chronograph. Neither is it a 7T27, which it resembles at first glance, because although the subdial functions may look similar it's got an extra pusher. Any 7Txx experts like to hazard a guess ? But not all of what I'd previously dismissed as '7T32's are quite what they seemed at first glance. I've shown (in the non-Seiko branded section) that a close relationship exists between Orient J39 and Puma Y19 model numbering. Apart from the obvious similarities in their layouts, note also the format of these two watch's sales codes: JCAE02A and ZHAE03D. 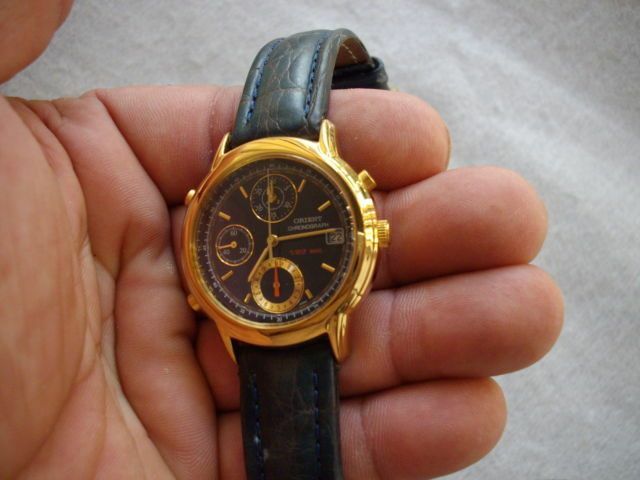 Seems a Polish watch enthusiast would like to know what movement it uses, too. Chodzi mi głównie kiedy był produkowany oraz jaki mechanizm był w nim stosowany. 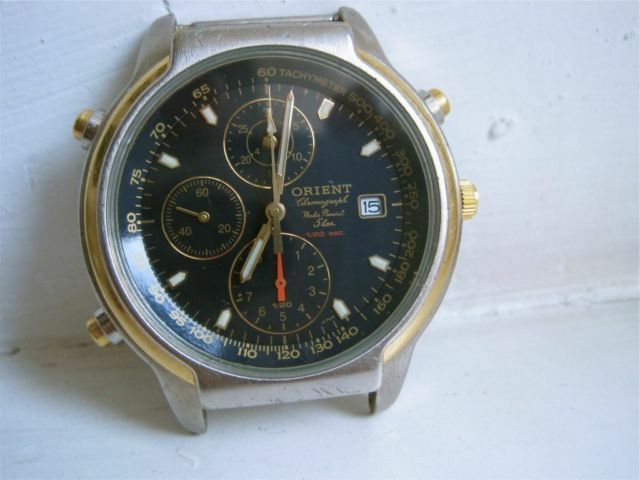 .... Orient 7T32's (or whatever the re-branded Orient Jxxxx calibre designation is). Anyway, with a little bit of googling, I answered that part for myself - thanks to Tony 'Anzac57'. 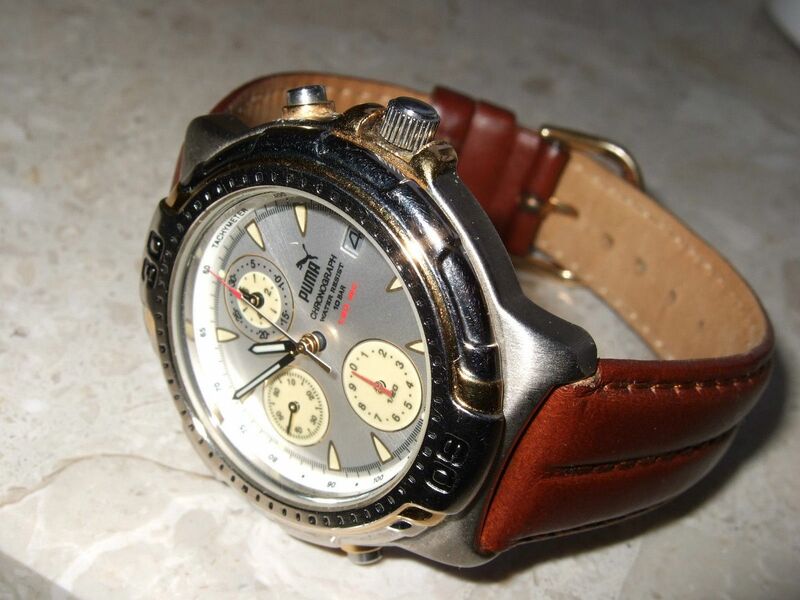 Quote: Uses Orient HFA00 quartz movement which is the rebranded Seiko 7T32. As with the Seiko 7T32 the second hand sweeps at 5 beats per second when activated. Interesting that Seiko went to all that trouble. 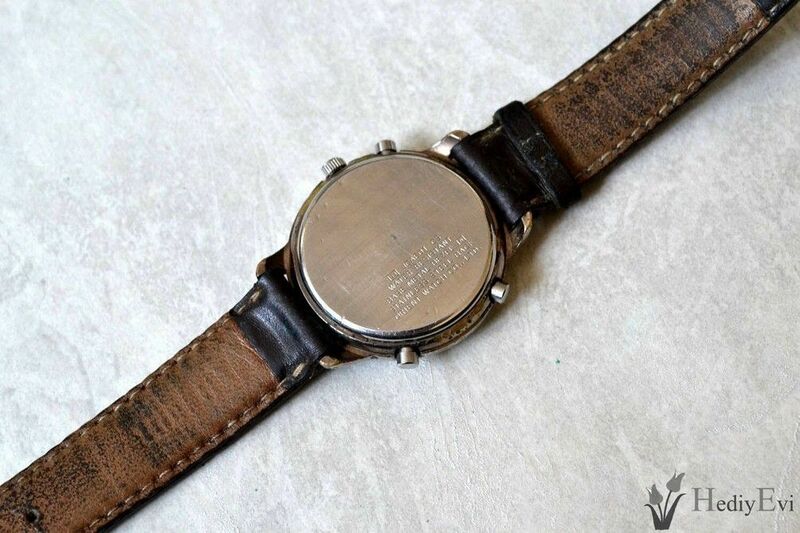 Apart from the HFA00 movement number, it's also stamped with Orient Watch Co. Ltd. Yet the 7T32's produced by Yema / C.G.H. 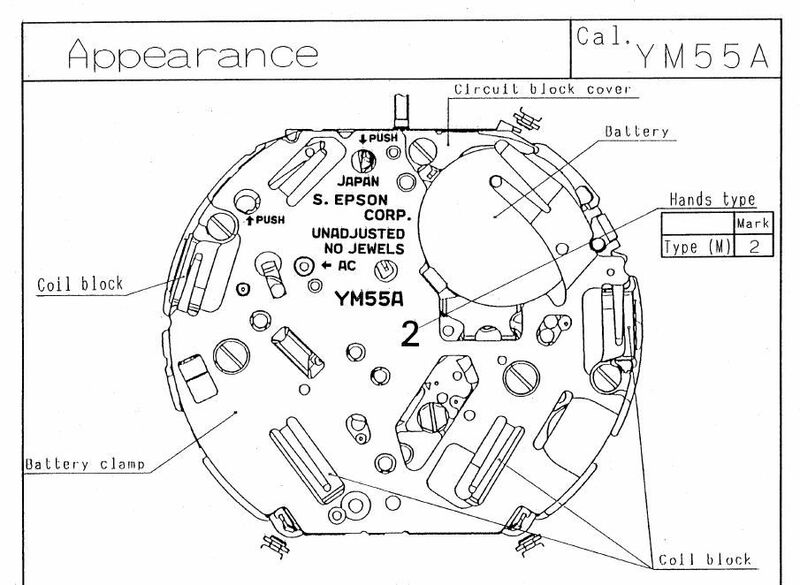 just use the S.Epson Corp. Y182B stamped movement (as opposed to the Seiko 7T32B). Belated Edit (January 4, 2015): Correction - It appears that Yema Y182B '7T32' movements were also stamped SHIOJIRI Ltd. But other than that, the rest of their reply didn't tell me much. Nor did they attach a .pdf of the Technical Specification, as they'd done previously when I enquired about the Orient J39601-70 / J3920 back in February 2010. So I've written back asking if they've got one. I don't like unanswered questions - especially when I've asked them myself. Even when they relate to humble 7Txx quartz movements. I was hoping that Orient Watch Co. might have replied yesterday - with a spec' sheet for their JCA00 movement showing a photo of it. Maybe it'll materialize next week. In the meantime, impatience had got the better of me. I went right the way through the Seiko 7Txx series of contemporary movements from 7T22(A) to 7T62(B), looking for a possible match. I looked briefly at the 5T32 / 5T52 series. Nothing matched exactly - in terms of functionality / subdials / crown and pusher layouts. I even stumbled across a Citizen / Miyota 7T35 movement - irrelevant, but amusing that they used the same numbering sequence. Then it dawned on me. 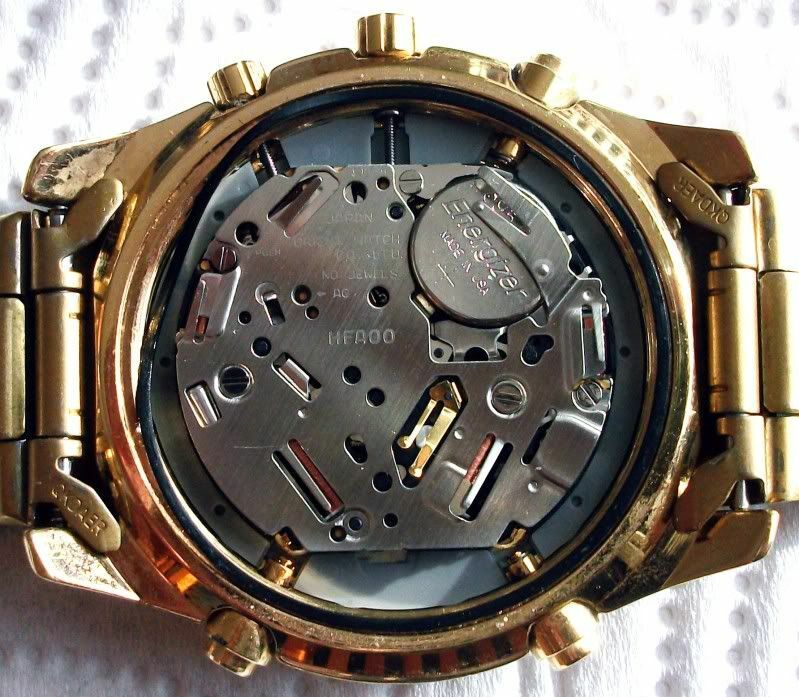 What if this Orient JCA00 movement wasn't actually based on a Seiko (per se), but a S.Epson Corp. movement. I've already demonstrated the obvious commonality between the Seiko 7T32B, S.Epson Corp. Y182B and Orient HFA00 movements. But where do you even begin looking ? 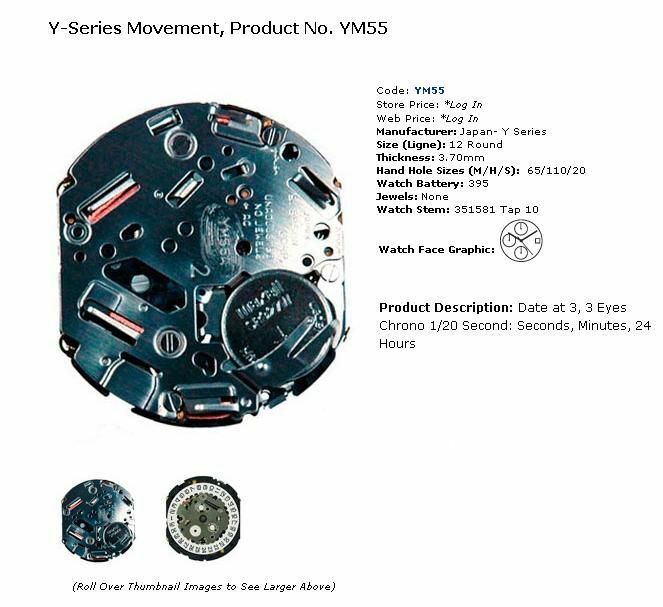 There are literally hundreds of S.Epson Corp. Yxxxx movements used in all kinds of watches. 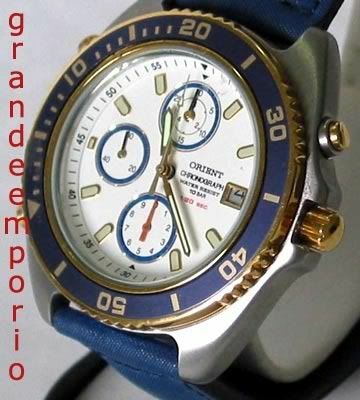 Well, I started off by googling images on Orient 1/20 quartz movement - and pretty soon I got lucky. Disregard all the extraneous 'pilot stuff' - slide rule bezel. etc. 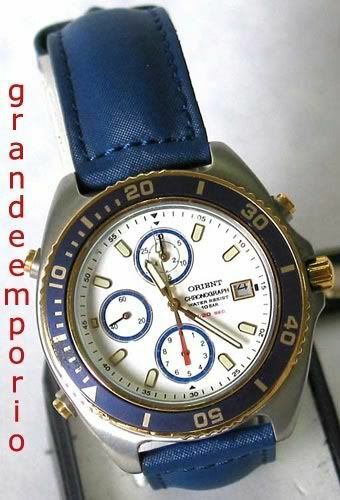 What matters is it has the same fairly unique 3 pushers @ 2 / 8 / 10 o'clock and crown @ 3 o'clock as the Orient JCAE02 in question. Not only that, but it's a 1/20s chronograph with date - and the functionality / markings of all three sub-dials are almost identical too. Most importantly - at the bottom, either side of the sub-dial a 6 o'clock is printed JAPAN MOVT. Movement - Japanese YM55 quartz movement, 1/20th second, 30 minutes and 6 hour elapsed time. 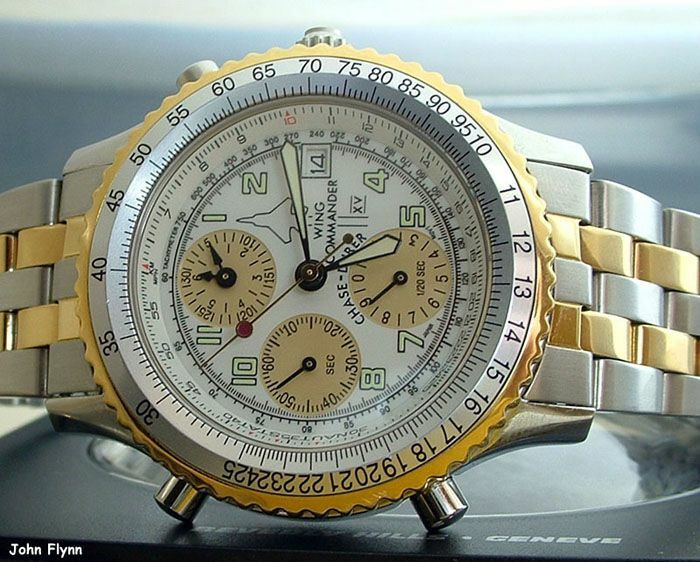 The chronograph has the 6, 9, 12 layout that is commonly seen in many quartz and automatic movements. The 1/20 sec sub dial is at 6, the full time sec sub dial is at 9, and the min/hour sub dial is at 12. What is different is that the pushers are in an unusual configuration. 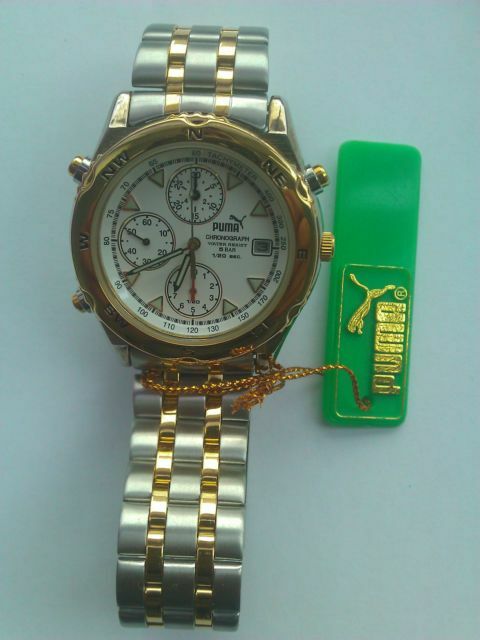 Only one pusher is on the right side of the watch, with two additional pushers on the left. The top right pusher starts and stops the chronograph, the top left pusher resets the chrono, and the bottom left pusher activates the lap time function. This lap function works just like the ones found on digital watches. It basically gives you a "split" time without affecting the "running" time of the chrono. 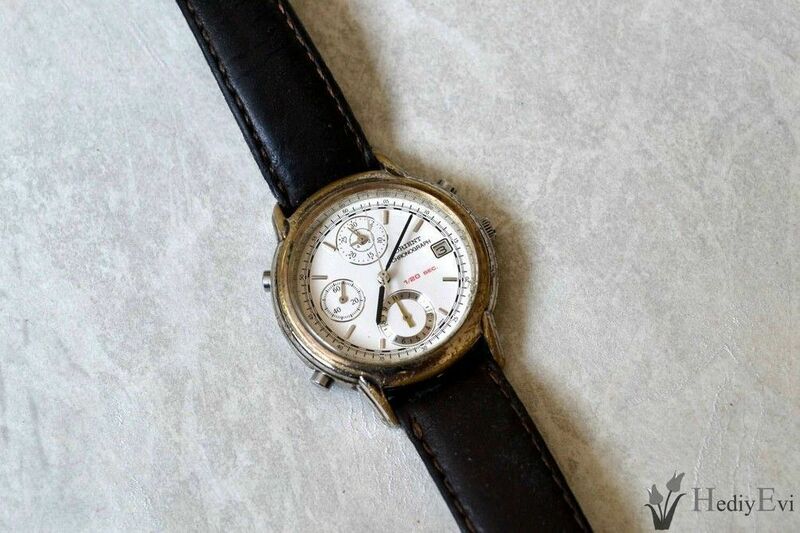 Another interesting aspect of this chronograph movement is the way the elapsed time is displayed. The sub dial at 12 is the one that keeps track of this. It actually has two hands, one for the minutes and a separate hand for the hours. As you can see in the photo, the outer markings on this sub dial track the minutes, while the inner markings track the hours, with a line in between each number to represent a 30 minute interval. Couldn't have put it better myself ! 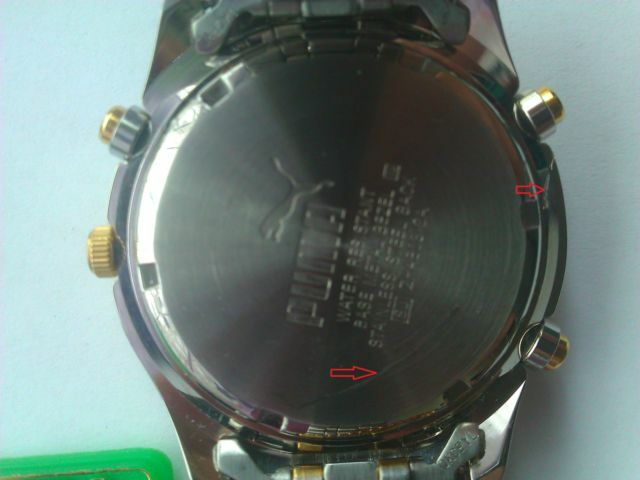 Look again carefully at the photos I'd posted of the Puma ZHAE03 and Orient JCAE02, and it's just possible to make the hands out. 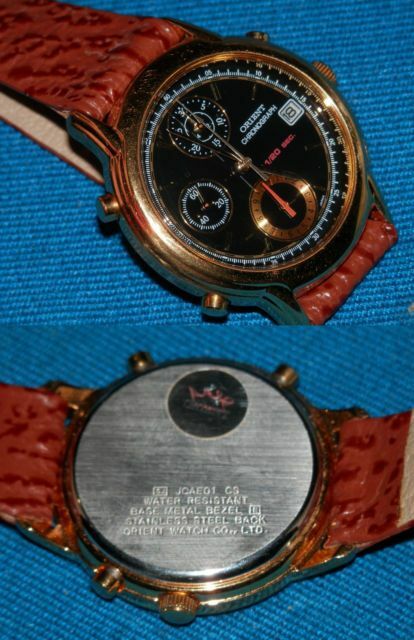 Anyway, thanks to roloya's post, I deduced that the movement used in this particular Chase Durer chrono' is a S.Epson Corp. YM55A. Unsurprisingly, the movement back-plate bears an uncanny resemblence to the Seiko 7Txx series that many of us are familiar with. 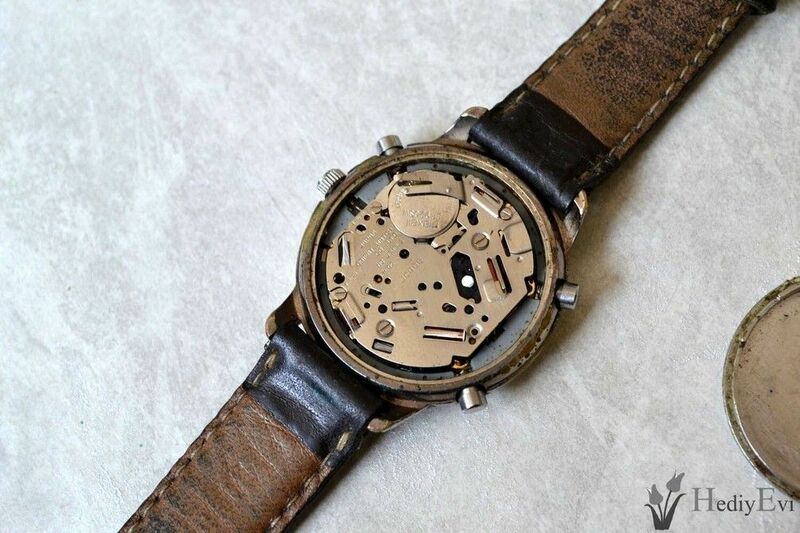 Unfortunately there aren't any chronograph movements there that have a similar layout. It seems this YM55A is a rare bird. There is a chance that Seiko uses a different name for it when used in Seiko-branded watches ("YM55A" is for OEMs). Well perhaps not quite all OEMs - Orient's re-branded JCA00 movement being one we've uncovered. Makes me wonder if there's a JEPIC Corp. branded version of that S.Epson / Orient 1/20s movement lurking inside that Puma. 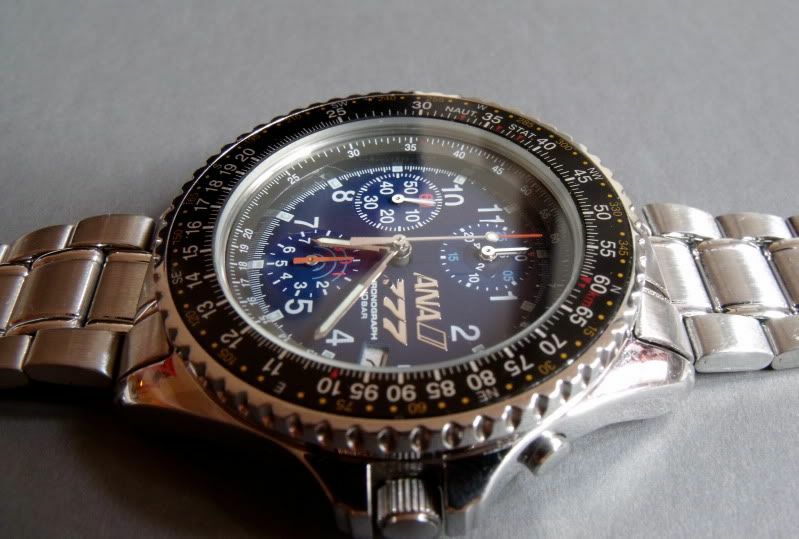 For sale is an ANA 777 Chronograph. 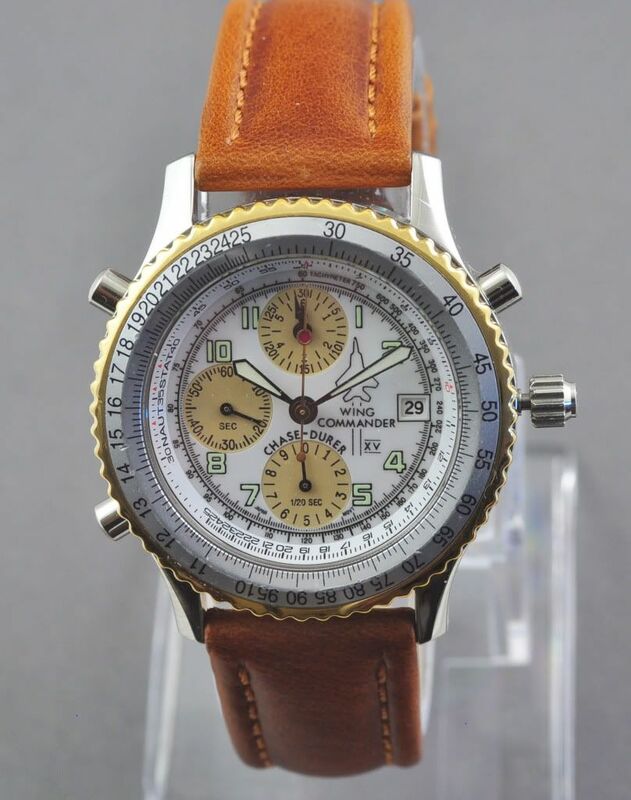 Another pseudo pilot's watch, of the same ilk as the Chase Durer Wing Commander. Note date window positioned @ 3:20 on this one. From there on, it was all plain sailing. Not just 'plain sailing', but I was soon pedalling downhill with the wind behind me. Don't worry, the link is quite safe to click on - and well worth a look. Trust me. The first 11 numbered pages have TIME MODULE INC. as a footer. And who exactly might Time Module Inc. (also based in Hong Kong as a limited company) be ? None other than Seiko Corporation in yet another guise ! 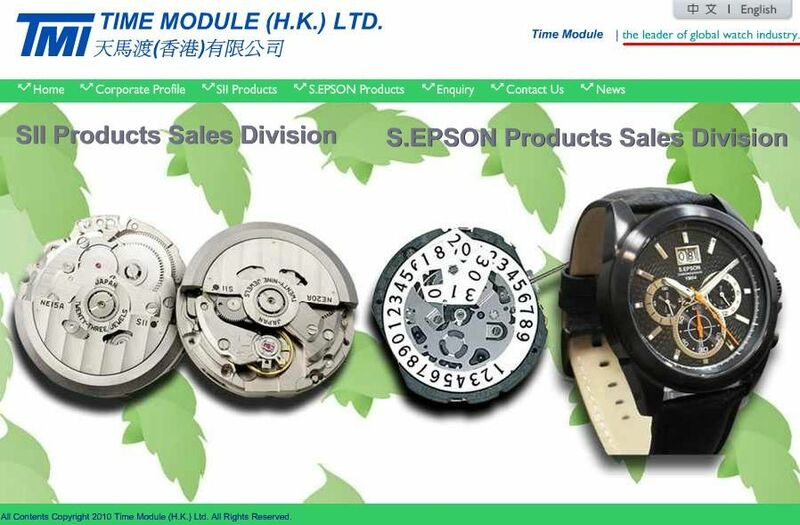 Time Module was established in 1987 with originally funds from SEIKO Corporation, SEIKO Instruments Inc. and SEIKO EPSON Corporation. *Shiojiri Ltd. being yet another manufacturing sub-division of Seiko Corp., as seen with Yema's Schimauchi Ltd. branded movements. Apparently there exists a dozen such Seiko / SII-owned companies, including Morioka Tokei Inc., which I recently came across myself. So I guess it's unlikely to be forthcoming. In the meantime, now I've become familiar with the configuration, I keep tripping over them. That's the Orient 'crown' hologram sticker at the top of the case-back. In fact, I'd given up on it. Thank you for your inquiry, also we are very sorry for late reply to you. Will you please review attached scanned manual of JCA00? Hopefully it may be useful for you. Not quite what what I was hoping for, in that it doesn't show any connection to the Seiko Epson YM55A movement, but nice to have. And another Orient JCAxxxx variant spotted on eBay Germany this evening. 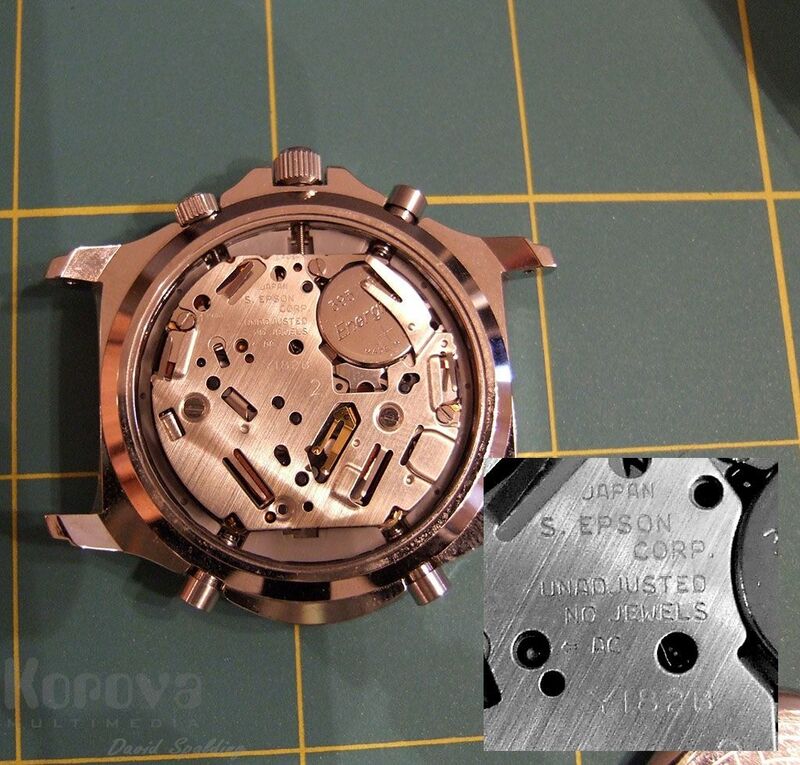 As you can see, if you zoom in on the lower photo, the movement back-plate is stamped Orient Watch Co. Ltd. JCA00 (NO JEWELS). Although not officially a member of the Seiko 7Txx family (being a re-branded YM55A), you've got to admit that, at first glance, it bears an uncanny resemblence to the Orient HFA000 (their re-branded 7T32). That's the reason why I started this thread in this section. It does appear to have a detachable bezel [DB] and a glued in crystal [CS]. So I'm a little closer to proving my theory, regards them. I'm still wondering how the movement in that Puma branded YM55A which started of this little thread might have been stamped. S. EPSON CORP., SHIOJIRI Ltd., Orient Watch Co. Ltd. .... Or perhaps the mythical JEPIC CORP. ! 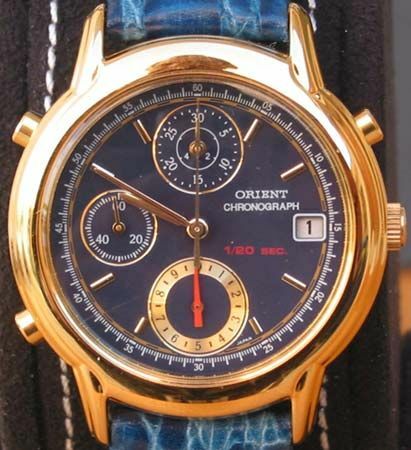 Spotted yet another of those Orient JCAE01G's earlier today, while searching worldwide (for something else) on Orient Cronografo. Clearly using the same re-branded YM55A caliber - be it Orient JCA00 or Puma / Jepic Corp. whatever - I'm still none the wiser. I'm getting quite good lately, at recognising these various YM55A powered chrono's popping up everywhere. 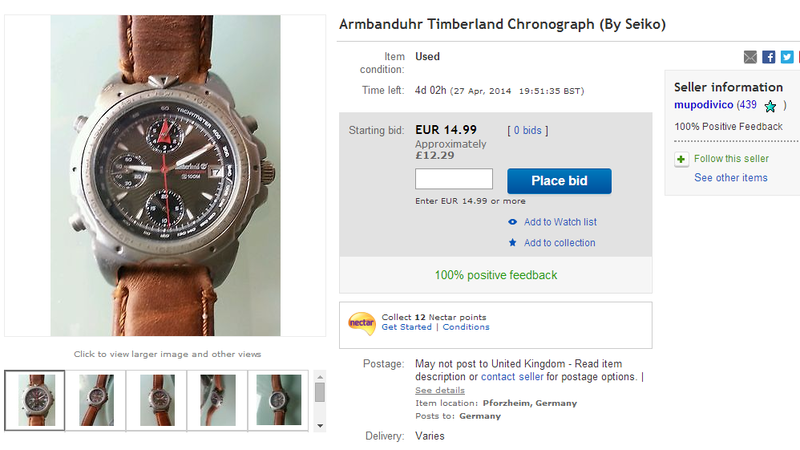 This Timberland listed on eBay Germany was easy to spot from the crown / pusher arrangement (basically as 7T32, less one crown). The hour hand in the uppermost sub-dial is that red triangle pointer. Note also the 1/20 second sub-dial is actually graduated to '20'. Interesting thread Paul, I imagine some parts are interchangeable between this movement and the 7T32, 7T27.